Minibus Match is a minibus-sharing scheme designed to meet the needs of community groups who would like to borrow minibuses. There will be a charge to cover the costs of running the bus. Minibus-owning groups can generate income by joining the scheme and lending out their bus in its down time. Minibus Match offers access to affordable transport for groups wanting to use a minibus for travel within Pembrokeshire or further afield. 0800 783 1584 with your transport request. 3. Finalise arrangements with the minibus lenders. We have a range of minibuses registered with the scheme, including wheelchair accessible vehicles and small minibuses which can be driven by volunteers on an ordinary car licence. 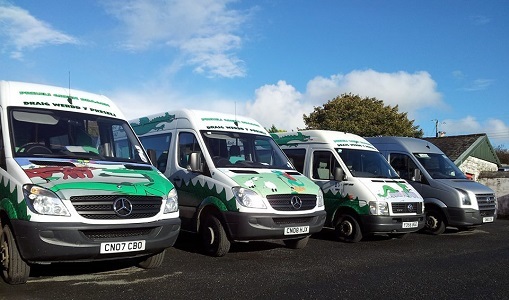 Minibuses are available at locations throughout Pembrokeshire. To search for a minibus click here. Groups are normally expected to provide their own driver. You will usually need to nominate a driver when you make a transport request. All drivers must hold a valid MiDAS Certificate. For information on MiDAS training click here. If your group does not have a driver we have a small pool of volunteer drivers who may be willing to help. It is helpful if groups can nominate a driver. Would you be willing to join this pool? If so, please call Craig on 07535 921528 or email craig@pacto.org.uk to find out more.